Sarah Boston, DVM, DVSc, DACVS, ACVS Founding Fellow of Surgical Oncology, is an associate professor of surgical oncology at University of Florida. She earned her DVM from Western College of Veterinary Medicine in Saskatoon, Saskatchewan, Canada, and completed a rotating internship and residency at University of Guelph. Past president of Veterinary Society of Surgical Oncology, Dr. Boston has authored numerous articles on surgical oncology and speaks nationally and internationally on the topic. She is a cancer survivor and the author of Lucky Dog: How Being a Veterinarian Saved my Life. Andre R. Spiguel, MD, is an assistant professor in the orthopedic surgery department and is on the musculoskeletal oncology team at University of Florida. He earned his MD from Pritzker School of Medicine at University of Chicago before completing a residency in orthopedic surgery at University of Chicago Medical Center. He completed fellowships in musculoskeletal oncology and orthopedic trauma at University of Chicago and Washington University, respectively. Dr. Spiguel’s clinical practice involves the treatment of bone and soft-tissue sarcomas of the extremities and pelvis, and he specializes in complex extremity reconstructions for limb salvage surgeries after tumor resection. This column co-presents clinical cases in a side-by-side format, with the patient—human or veterinary—as the primary variable. 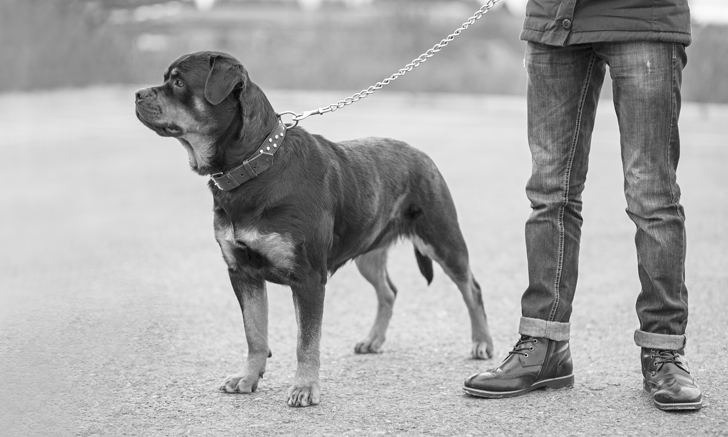 It is the hope of the Clinicians Brief team that readers will see the inherent commonalities in managing cases of similar diseases, regardless of species. The Zoobiquity series is based on Zoobiquity by Barbara Natterson-Horowitz and Kathryn Bowers. 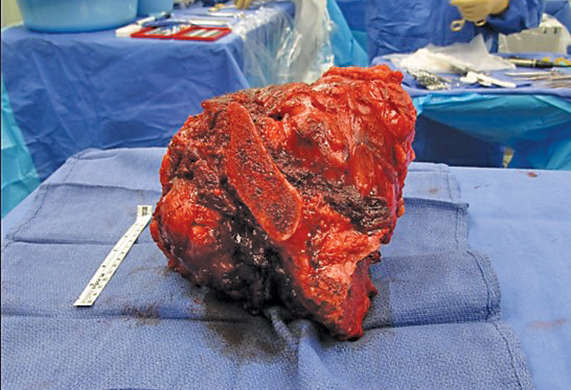 A 36-year-old otherwise healthy man with a history of multiple hereditary exostoses (MHE) noticed a painful mass over the right ilium that had slowly enlarged over the past year. He was referred to a musculoskeletal oncologist and presented with previously obtained radiographs. On physical examination, the patient was pleasant and in no acute distress. He had a large nonmobile mass over the right hemipelvis. He was able to ambulate normally without any deficits. The rest of the examination was otherwise unremarkable. 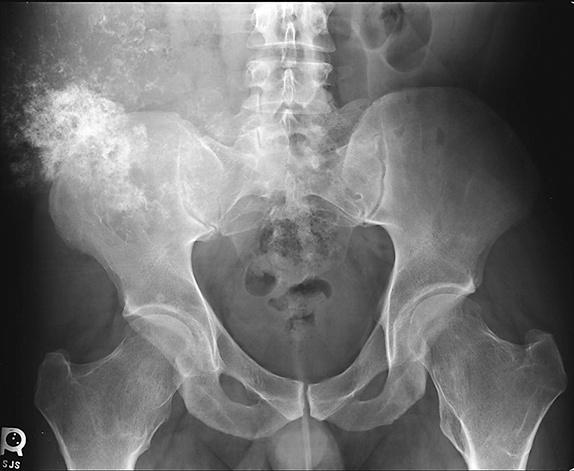 Previously obtained anteroposterior pelvic radiographs (Figure 1) showed a large, poorly defined, mineralized lesion involving the right ilium. Because of the patients physical examination results, history of MHE, and radiographic findings, a secondary chondrosarcoma of the right ilium was suspected. Further diagnostic evaluation, including a CT scan (Figure 2) and MRI of the pelvis, were obtained to further characterize the lesion and begin surgical planning. Because the lungs are the most common site of metastasis in cases of chondrosarcoma, staging was determined via bone scan and chest CT, which confirmed that there were no other sites of disease. Staging was determined to be Enneking Stage IB; prognosis was good overall. Core needle biopsy confirmed low-grade chondrosarcoma. 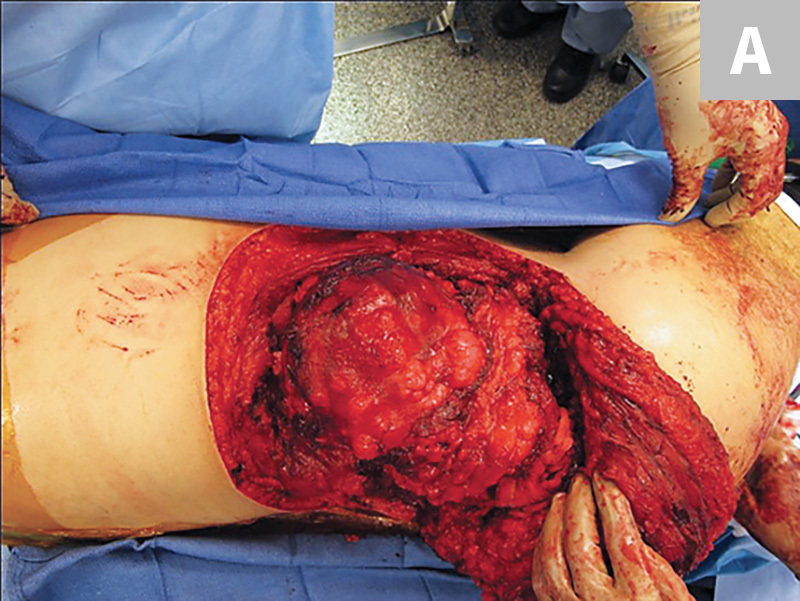 Low-grade secondary chondrosarcoma with no other sites of disease is treated definitively with resection when possible. Neoadjuvant treatments (eg, radiation, chemotherapy) are of limited value and used only in palliation with limited success.1-3 Because of the patients age and good prognosis, and no need for adjuvant treatment if a negative margin could be achieved, reconstruction was elected to restore the pelvic ring in the setting of an iatrogenic disruption. The right ilium was resected by cutting through the sciatic notch toward the anterior inferior iliac spine and cutting through the sacral ala posteriorly to ensure a negative margin (ie, internal hemipelvectomy), which allowed for preservation of the right acetabulum and right hindquarter (Figures 3 and 4). 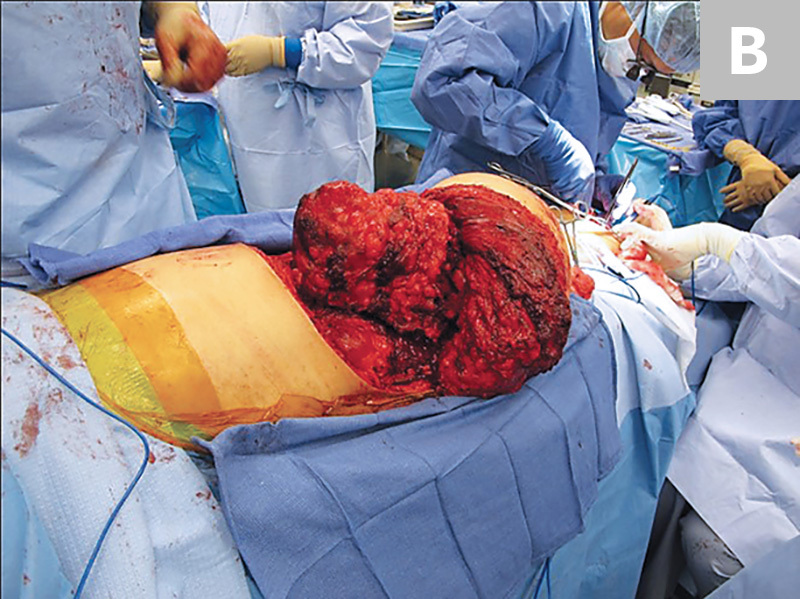 Reconstruction was performed using lumbopelvic fixation and a double-barrel vascularized free fibula autograft harvested from the ipsilateral leg (Figure 5). Postoperative radiographs showed resection and reconstruction (Figure 6). FIGURE 3 Intraoperative photos obtained before bony cuts. The soft tissues are mobilized circumferentially around the mass (A). 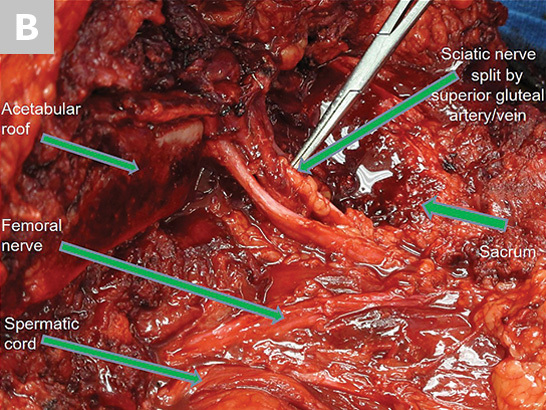 The microvascular surgeon can be seen harvesting the autograft fibula from the ipsilateral leg while the resection is being performed (B). 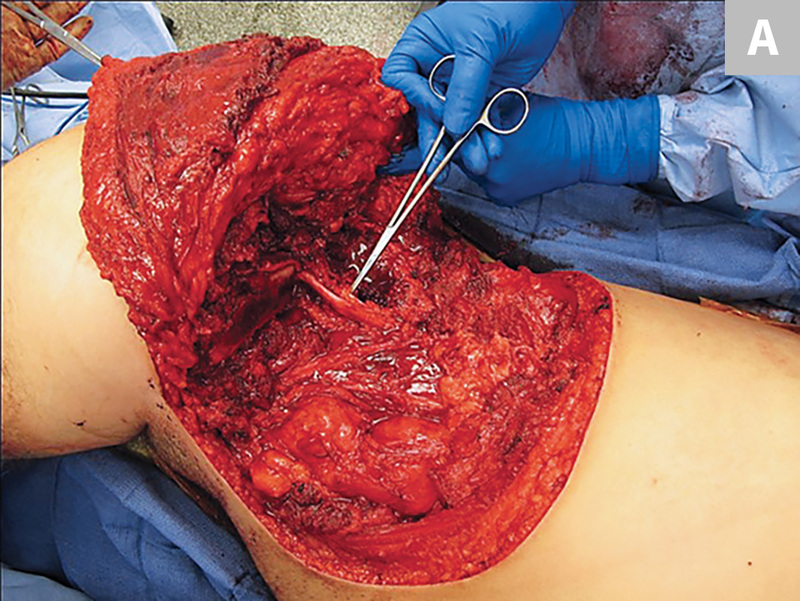 FIGURE 4 The pelvis after the bony cuts have been made and the specimen removed. A tonsil pointing to the sciatic nerve and the superior gluteal artery/vein (A), as well as the important structures labeled for orientation (B), can be seen. The patient recovered well from surgery. Pain was controlled using a standard lumbar epidural immediately postoperatively. Two days postoperatively, the patient was doing well and the epidural was weaned. 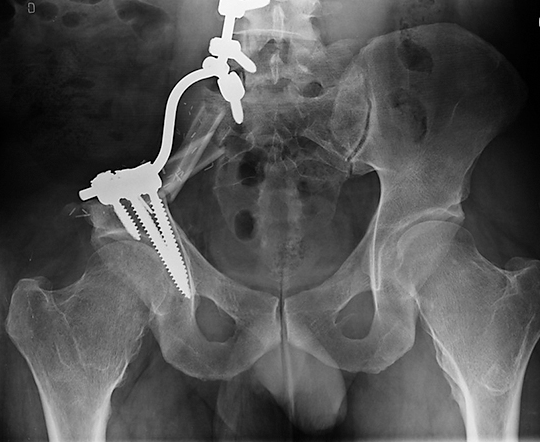 Through reconstruction and stabilization of the pelvic ring, the patients recovery was significantly advanced. He was discharged 5 days after surgery on oxycodone (10 mg PO q4-6h as needed for pain) and low-molecular weight heparin for thromboprophylaxis. To protect his construct, he was made toe-touch weight bearing for 3 months. The patient was seen for surveillance, including radiographs of the pelvis and a CT scan of the chest, every 3 months for 2 years. At 3 years postoperation, surveillance is performed every 4 months, then every 6 months for years 4 and 5 postoperation. After 5 years postoperation, he is considered cured. 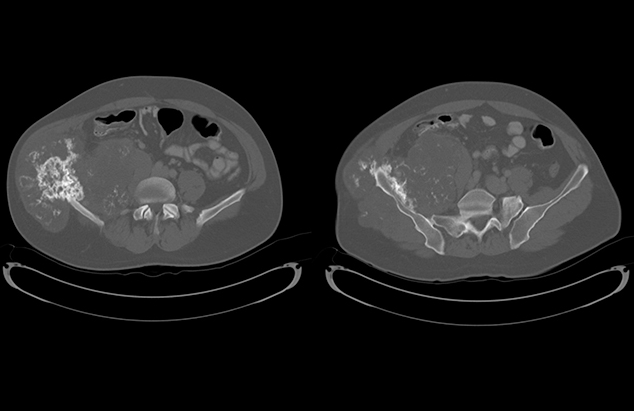 Because of his history of MHE and increased risk for subsequent secondary chondrosarcomas arising from prior osteochondromas, he will continue to be seen every year for clinical examination, pelvic radiographs, and any imaging of painful or enlarging osteochondromas. Simon MA, Springfield D. Surgery for Bone and Soft Tissue Tumors. Philadelphia, PA: Lippincott-Raven Publishers; 1998: 276. Gitelis S, Bertoni F, Picci P, Campanacci M. Chondrosarcoma of bone: the experience at the Istituto Ortopedico Rizzoli. J Bone Joint Surg. 1981;63(8):1248. Bjornsson J, McLeod RA, Unni KK, Ilstrup DM, Pritchard DJ. Primary chondrosarcoma of long bones and limb girdles. Cancer. 1998;83(10):2106.